Meet the students, teachers, and parents of Ravenswood. This year we proudly share the stories of individuals in our community who make Ravenswood what it is today. ​Check out our 2017-18 Annual Report! ​All children deserve the best possible education. The six elementary schools and one middle school in East Palo Alto and eastern Menlo Park that comprise the Ravenswood City School District are filled with students with big dreams. Yet they also face underfunding, low teacher salaries and retention, and overwhelming socioeconomic challenges. These issues lead to school performance that lags that of neighboring school districts, resulting in an uneven playing field at the start of high school and a community that under-leverages some of our best talent. Our approach to these challenges is to work with the visionary and talented leaders in Ravenswood and create a community where teachers are supported, students are inspired, and the trajectory of lives is changed forever. Hundreds of dedicated volunteers, strong community and corporate partners, and a growing body of individuals and family donors are committed to the idea that together, we can achieve excellence in ALL our local schools. 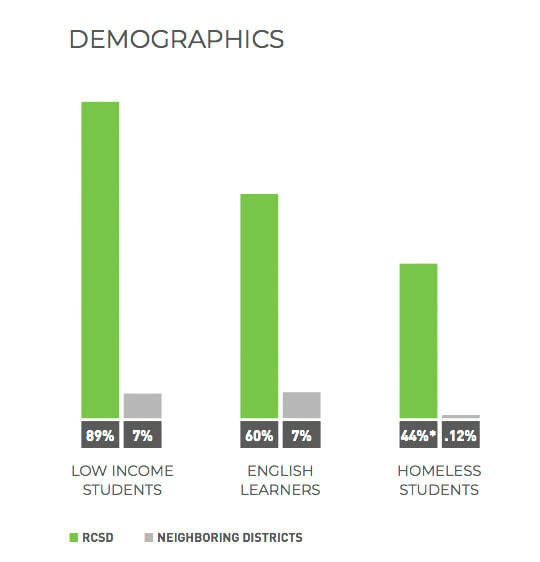 Homelessness is the brutal reality for many Ravenswood school district students in eastern Menlo Park and East Palo Alto. To learn more about the obstacles our student's overcome on a daily basis, CLICK HERE. Sign up to receive our newsletter updates and to stay in touch!